I am delighted to announce that last week, after a blissful thirteen-month romance, I proposed to the lovely Miss S, and she said yes! I am engaged to be married, and couldn't be happier! Hmm... would she prefer anonymity in the blogosphere? Her parents are placing an announcement in the Jewish Chronicle, England's journal of record, and I announced here. My parents and hers talked by phone; they all seem to get along. S and I are incredibly lucky to have such wonderful family and friends. The bride and I went shopping for an engagement ring last week and were greatly assisted by AlexK, him of recent beautiful wedding fame, renowned worldwide for marrying an incredible woman, and being part of the story of how I met my fiancée. 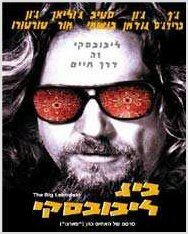 As an anniversary card, I received a postcard showing the original Hebrew movie poster for The Big Lebowski-- check it out above. Sweet, huh? I think the rug really ties his sunglasses together. Shout-outs to my peeps at Lebowski Fest, Walter Sobchak, and all those keepin' shomer fu@kin' Shabbes. Anyway, she and I had dinner for two at Caňela (Restaurant Motto: "Don't ask us how to pronounce it; that 'n' should have an umlaüf over it!"). Our wine steward was a nice fellow whom S recognized from the excellent restaurant 1868, where we had a great wine tasting dinner with her parents some time ago. Madonna once ate there too, don'cha know. I hear The Material Girl eats her steak like a surgeon. Cuttin' for the very first time. Before dessert, I had to ask her something. I held her hands and she cried. Though she considered answering my proposal with, "It's been so long, I have to think about it..." ;) Miss S said yes. Then we had dessert and called our families. Mmm... dessert. Chocolate... Where was I? The first week of our engagement was joyously spent watching Family Guy DVDs from our friends R and E, staying warm and cozy on Shabbat, doing Sudoku, enjoying dinner (mmm... cheese...) at R's house Friday night, making and receiving phone calls, and devouring apple crumple because Miss S is no slouch when it comes to baking and cooking and naming things! We are making out a guest list, selecting possible locations (around Jerusalem), and planning to visit the U.S. of A. after the wedding. We don't have a date set yet. I mean, do you have any promising leads? you are just lovely but I am not sure i will ever get used to you using words like peeps. i love you! A hearty Mozzeltov from me and all the ducks. I am so happy for you! Congratulations to both of you. Mazel Tov! Sorry about the long delay, but I've been meaning to send you a massive Mazel Tov since I heard, which was actually not long after the event took place. So, with no further delay, here it is: One! Massive! Mazel! Tov! I had a good feeling about you guys since that day in the theater about a year ago. Hey, congratulations to the 2 of you! And Mazel Tov! Ok, I've never said that before in my life. But I've always wanted to! So thanks for giving me that opportunity.